Hello Ladies. We went to see the Total Eclipse in Greenville, SC and it was so amazing! My hubby took some good shots so I hope to share more of that and my day’s adventure on the blog most likely Friday. Puppies were so good and it didnt phase them It really was a great event with people cheering when it went to Total Eclipse. We were gone until late in the evening when we got home, as there was a bit of traffic! This is favorite day to see all of your fashions and to influence me to spend more money on clothes! hehehe. 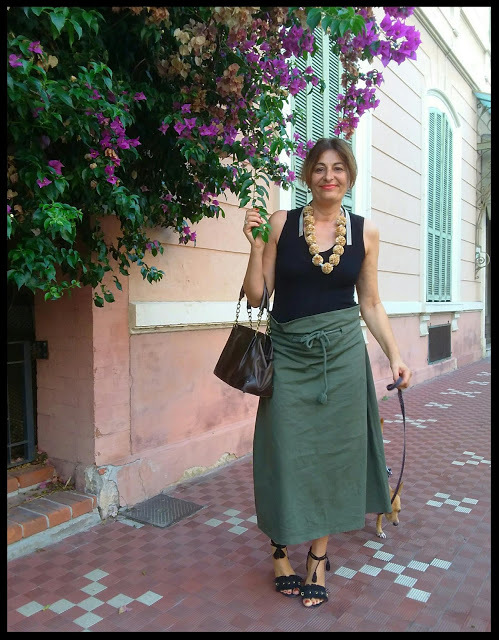 I am bringing you some amazing accessories from Uno Alla Volta, a company in which I have partnered HERE, HERE, HERE and HERE. Do you ask the questions, how do my accessories make my look? What do they say about me? Can you think of wearing an outfit without a purse? Or without your choice accessories? It would kind of feel bland, right? Accessories take a look to another level and ususally show our personalities. I collect vintage brooches, and love the story behind them. 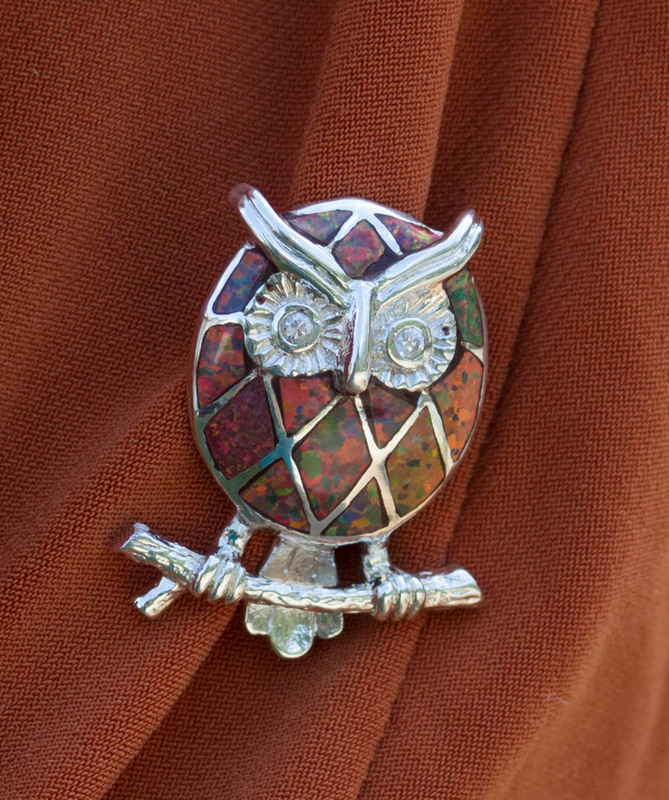 Well, I am wearing this Mexican fire opal owl brooch, from Uno All Volta, made by artisan, Leon Nussbaum, as the shades from the fire opal sparkle in tones ready for Fall. Greens, yellow, red, blue, purple, all sparkle amidst the beautiful sterling silver. I love this piece, as the fire opal reminds me of the opal piece which reflects colors that I bought in Santa Fe, NM last year. I love a love for brooches and will be sharing just how to style them for Fall as well. The next item that was sent to me was the Florentine Suede Fringe Clutch Purse-“Exclusively Italian by design, materials and craftsmanship, this roomy tan suede clutch purse with hand-trimmed details is masterfully handcrafted, one at a time, in Florence, Italy by our artisas Elisabetta and Alessandra.” The fringed camel suede clutch because of its neutral shade can be worn with so much. The suede is luscious and the clutch sturdy and very well made. I was thrilled to receive this, as I wanted a neutral clutch to add to my handbag collection., Each of these items are made one at a time, making them very special pieces, as the artisans put their heart into the design and craftsmanship. Purse measures approx. 11 in. x 19.75 in. when open. I would like to say that these pieces say, ” I love unique and well crafted accessories. I have a sense of whimsy and fun ( the owl and the fringe design) and love the upcoming season. i LOVE the colors that are in this pin, sparkling in the sunlight. As a reminder, Uno Alla Volta, means “one at a time” and it the way the artisans craft their art, as well as their philosophy on living. Take one day at a day, moment at a time, appreciate the things around you. I can appreciate this sentiment as I find myself doing just that. I am a big fan of these cargo loose pants, and bought them in three different colors a few years ago. I wanted the accessories to compliment this look. Here are some other great accessories from Uno Alla Volta. Choose something that says something about you. What do you want to convey with your accessories? Check out their new necklaces HERE. For all of you scarf fans, see some of my favorites HERE. Handbags, check them out HERE. 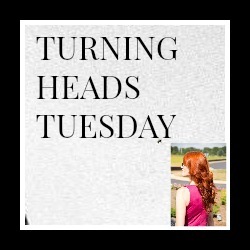 TIME FOR TURNING HEADS TUESDAY LINKUP! Please visit other bloggers, this is a great way to get to know other bloggers. Please use the code below the Turning Heads Widget to paste into your sidbar if you wish. 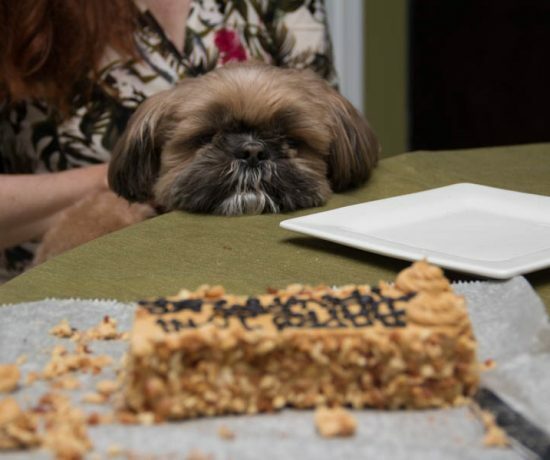 Most clicked- The Pretty Cute Blog. 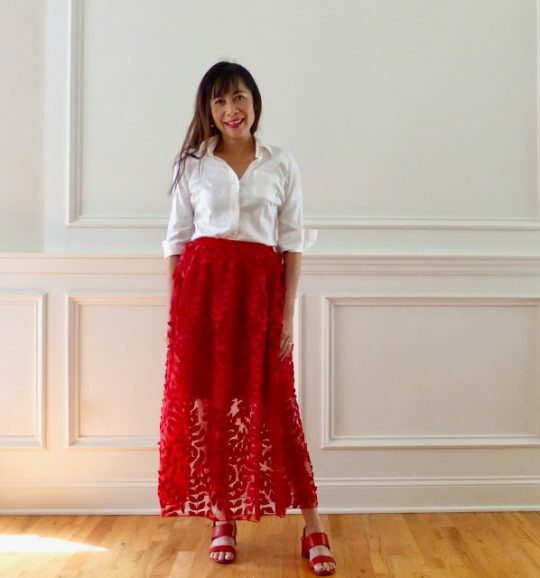 Pinterest Pic of the week- Adore this red textured maxi skirt on Pret-a-vivre Blog. Love the orange shade for fall! You look beautiful! 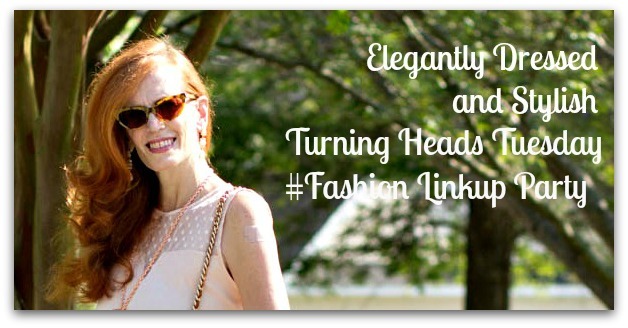 Thanks for joining the Top of the World Style linkup party with your great look. I have this fringe bag from Uno Alla Volta too and I love it! Great brooch! So pretty! I love the pumpkin colored top. And now I an lusting after one of those buttery suede bucket bags with the tassel. Wow are they gorgeous. Hope your week is going well doll! I’m loving this look! Cute clutch! Love this autumn look! Thanks for the linkup! The eclipse in 2024 will come across Texas and I will be so excited to check it out after seeing all the photos and videos from totality locations! 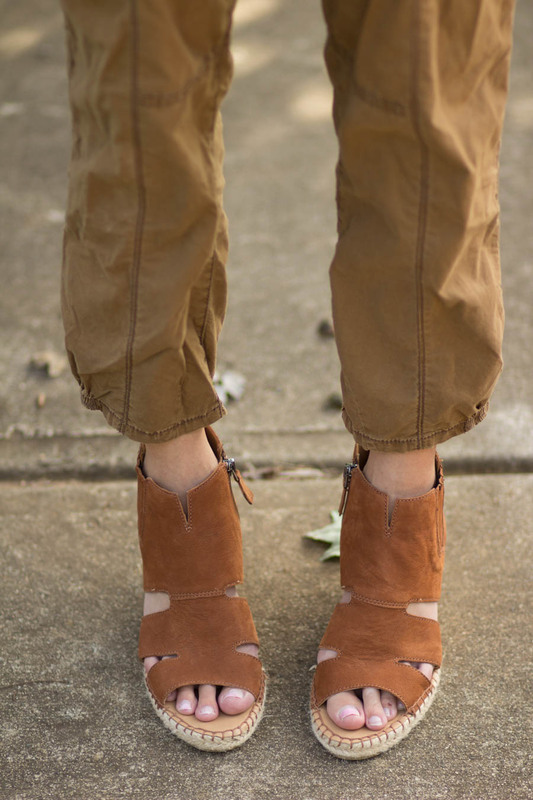 Rust just makes me think of fall and I’m soooooo ready! OMG your photos are fabulous!!! Love this look on you babe. SO PERFECT! Love that fringe clutch. How fun! Such a pretty suede clutch! I have a similar one, and they really are perfect for fall. Thank you Emma! You know I am a fan of fall colors and dressing and wanted to add a touch with the orange/rust top I am wearing. Yes, that is what I love about Uno Alla Volta is that every piece is unique. Thats great! I’m loving these super cute shoes! Perfect colours for the fall! This outfit looks so great on you! I agree with you about what well chosen accessories can do for an outfit. I love adding some jewelry, a scarf, or a great bag to an outfit to add detail and interest. Thank you Kimberly! I wanted a casual look and can see the accessories with a boho style as well. So right, I would feel strange without some accessories to make the look! Can’t wait to see those eclipse pictures. Up here in Mass we only got 60% coverage so not super impressive! Unlike that owl brooch and bag, which are fab 🙂 Love that little owl, reminds me of the 1970s. So does the bag for that matter. Way back in my hippie chick days I remember my collection of fringed bags. Still love them. That pumpkin top with all it’s draping and ruching is so flattering. Need to find one like it. I love the fall colors in this outfit, plus those pants. I hear so many people criticize cargo pants, but yours are absolutely lovely and work so well to add an extra texture to go with those accessories. What a wonderful experience, Jess! Love your look..you always make the best color choices! Thank you Rosemary! I used to wear black all of the time, and now I wear it once in awhile, as I do prefer color 🙂 The Eclipse was something to see. Love those accessories Jess, particularly the fringed bag and brooch. You’re right, good accessories are so important to the overall look of an outfit. Great color combination! Your cute little owl brooch and statement fringe clutch really added fantastic visual interest to your look. The boys and I enjoyed watching the eclipse together and enjoyed this once in a lifetime experience. We were careful to avoid I-85, as the traffic was incredible yesterday. What a fabulous statement clutch! And I love the neutral color so it can go with anything! That brooch is gorgeous too! I love the colors! Great transitional look, Jess! Perfect with your coloring! Can’t wait to see your photos from the eclipse! Love this look! That top especially is so pretty. So glad you got to see the total eclipse. Your style never disappoints! This outfit is so me! Those booties are amazing and that pin is such a fun touch. Beautiful as always! Peace! I really like the tassel details on your bag! Thanks for the link up Jess…have a great week! Sadly no eclipse here, it was night time in Australia, ha! This is such a fabulous outfit, Jess!! That fringe purse is so my style—I love it!! 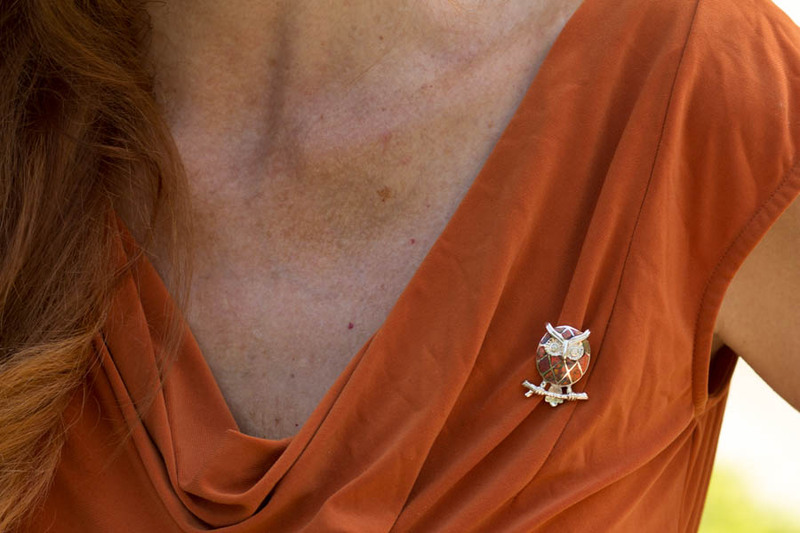 And if you’re not careful, my mom will be coveting that owl pin—she’s an owl lover!! Jess, these colors are definitely “your” colors! The fall colors are so amazing on you. And this clutch is just fabulous! I adore the owl pin and your sandals, too. Always gorgeous, my friend! How fun to experience the total eclipse. We only had a partial eclipse in upstate NY, but I watched the total eclipse on tv which was pretty cool, too. Although I am sure it was much more fascinating to view live in person. Wasn’t the eclipse so cool?? I would have loved to see it in SC! Whatever color you where, I think to myself, ‘This is her color!’, you look great in every color. These earthy tones look beautiful on you. Love your clutch and shoes ! The fringe clutch and owl brooch are certainly both special and unique pieces. I certainly agree that accessories are the best way to ring the changes. I will look forward to your eclipse photos.Thank you for hosting Jess. 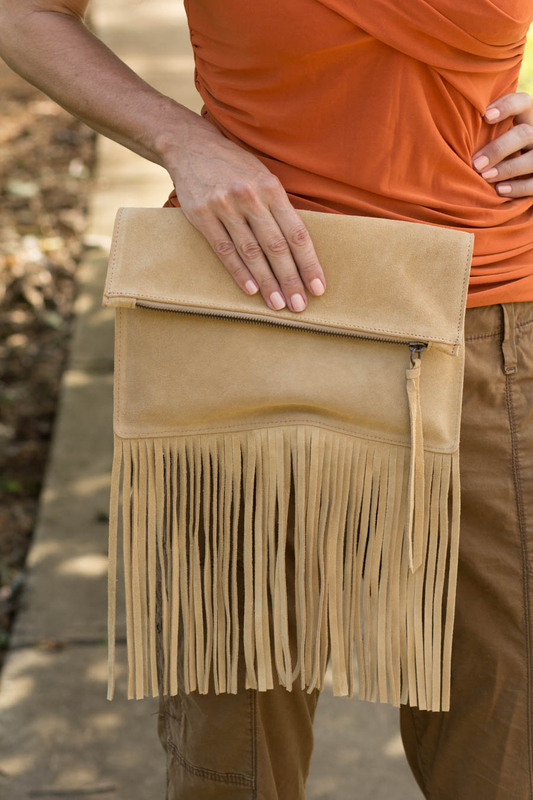 I love the color of your clutch and the fringe is such a fun, eye-catching detail! Wish we could have watched the eclipse here, but in Jordan it was already dark outside…ha! I love your cute brooch and fabulous clutch Jess…. and your photos are stunning! Looking fabulous as always Jess! We watched the eclipse too! So exciting! It was all over the news here in the Netherlands! I had to think about all of you! It must have been a fantastic experience. Love the colors you are wearing today, those colors suit you so very well!